Updated Sept. 19, 2015: Quotes from players and coach Al Golden have been added. 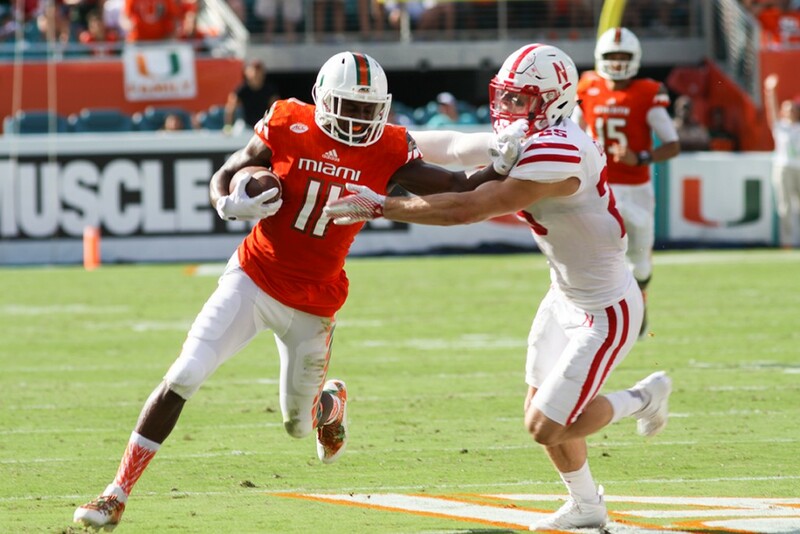 The Hurricanes pulled out a 36-33 win in overtime over the Cornhuskers, but only after Nebraska shockingly scored 23 unanswered points in the fourth quarter to tie the game at Sun Life Stadium on Saturday. Sophomore kicker Michael Badgley nailed a 28-yard field goal in overtime to net the Canes the win. Badgley went 5-for-5 on field goal kicks. Sophomore quarterback Brad Kaaya wasn’t surprised by his friend’s kick to win the game. After all, Badgley predicted he would beat Nebraska last summer. Miami (3-0) went up 33-10 on a 28-yard field goal by Badgley with 11:14remaining in the fourth. Nebraska (1-2), after struggling to move the ball all game, moved down the field with ease and scored three touchdowns to send it into overtime. Junior defensive back Corn Elder intercepted Nebraska quarterback Tommy Armstrong Jr. on the first play of overtime and the Canes took over only needing a field goal for the win. Armstrong entered the fourth quarter with 125 yards on 10-of-24 passing. The junior Cornhusker torched the Canes for 184 yards and three touchdowns in the final frame. The defense took a hit at the 9:25 mark when safety Deon Bush was disqualified for targeting a defenseless player. Nebraska took advantage of the senior’s absence and made it 33-18 on a 10-yard touchdown pass from Armstrong to junior receiver Alonzo Moore. Armstrong led Nebraska for another touchdown to make it 33-25 with 3:46 remaining. The Cornhuskers took over on their own 10-yard line trailing 33-25 with 2:39 remaining in the game. Armstrong connected with receiver Brandon Reilly for 41 yards down the right sideline to give Nebraska a chance to tie it. Miami safety Jamal Carter joined Bush in the locker room with another targeting penalty for his hit on Reilly. Five plays later, Armstrong connected with Stanley Morgan Jr. from eight yards out to cut Miami’s lead to two. Armstrong hit receiver Jordan Westerkamp in the back of the end zone on the two-point conversion, and incredibly, this game was tied. The Canes opened the game with a near-perfect performance in the first quarter. The team forced two three-and-outs on defense and scored on all three of their possessions. Kaaya was sensational in the first quarter, throwing for 143 yards and two touchdowns to six different receivers on 9-of-13 passing. The captain out of California marched the Canes 65 yards in five plays on their first drive, finding sophomore Christopher Herndon IV in the end zone from 10 yards out for his first career touchdown. Kaaya followed that up with an 11-yard touchdown pass to sophomore Tyre Brady, the first of his career, on the next drive. A 38-yard pass to senior receiver Herb Waters put the Canes in the red zone, and Miami only needed four plays to go 60 yards for the score. Nebraska came into the game with the 119th ranked passing defense in the country out of 127 teams, and lived up to that ranking. The Cornhuskers fared better in the second quarter, getting more pressure on Kaaya with their front seven. Freshman defensive end Freedom Akinmoladun sacked Kaaya for a loss of 12 yards to help force a three-and-out late in the half. The teams traded field goals in the second quarter. Junior kicker Drew Brown nailed a 49-yarder for Nebraska while Badgley knocked one in from 27 yards for the Canes. Nebraska threatened to cut Miami’s lead to 10 when the Cornhuskers took over on their own 49-yard line with 2:26 remaining. Armstrong connected with Morgan for 27 yards on a third-and-18 to get the team into scoring territory. Nebraska had the ball on Miami’s 14 with 36 seconds left, but came away with nothing after junior defensive Artie Burns made his third interception of the season on a bad throw by Armstrong to the end zone. The Canes outgained the Cornhuskers 254 to 152 in total yards and averaged 7.3 yards per play to Nebraska’s paltry 4.8 in the first two quarters. Redshirt senior receiver Rashawn Scott caught five passes for 114 yards including a 52-yard catch-and-run to set up Badgley’s field goal in the second quarter. The fifth-year player out of Melbourne Central High School caught nine passes for 151 yards. Sophomore running back Joseph Yearby was solid with 36 yards on five carries, but freshman Mark Walton struggled on the ground, finishing the half with three yards on three carries. The first-year player out of Booker T. Washington had two touchdowns called back for holding penalties in the second half. The Canes went into the half up 20-3 and received the ball to start the third quarter. Kaaya picked up right where he left off with two quick passes to Scott and junior tight end Stan Dobard for 24 yards. Yearby was the star of the drive though. The second-year back out of Miami Central cut up the middle and took off for a 41-yard touchdown run to put the Canes up 27-3 with 13:50 left in the third quarter. Yearby finished the game with 125 yards on 17 carries. The Cornhuskers responded with their first touchdown drive of the game. Armstrong managed to escape pressure multiple times as he marched the team 75 yards in 10 plays for Nebraska’s first touchdown of the game. Armstrong eluded a defender right in his face and found junior receiver Jordan Westerkamp in the middle of the end zone for a 22-yard touchdown pass. Bush sent the canes into the fourth quarter up 30-10 with an interception to end the third. The deflected ball fell right into Bush’s chest as he lay on the ground. The Canes took over on Nebraska’s 23, but weren’t able to do anything with the great field position. Kaaya threw his first interception of the season on a pass intended for Dobard in the left corner of the end zone. Kaaya finished the night with 379 yards and two touchdowns and one interception on 25-of-42 passing. Miami outgained Nebraska 511 to 462 in total yards and both teams finished with 24 first downs. The Canes were just 3-of-14 on third down conversions, continuing a troubling trend for the team that dates back to last season. The Canes next face Cincinnati at 7:30 p.m. Oct. 1 in Ohio.